Make tasty BBQ chicken wraps everyone will love. 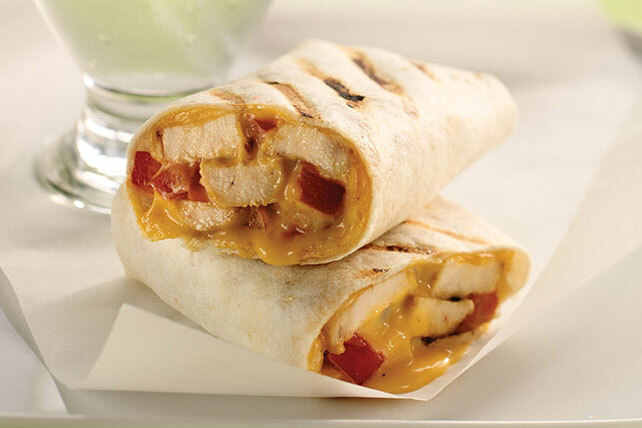 These Grilled BBQ Chicken Wraps feature cheddar cheese, tomatoes and a zesty blend of dressings. Brush chicken with dressing. Grill 6 to 8 min. on each side or until done (165ºF), brushing with 1/4 cup sauce for the last few minutes. Cut into strips. Spoon remaining sauce down centers of tortillas; top with chicken, cheese and tomatoes. Fold in opposite sides of tortillas; roll up burrito-style. Grill, seam-sides down, 8 to 9 min. or until golden brown, turning after 5 min. Serve with a mixed green salad for a quick-and-tasty weekday meal. Add chopped fresh cilantro to filling. Or serve topped with BREAKSTONE'S or KNUDSEN Sour Cream.